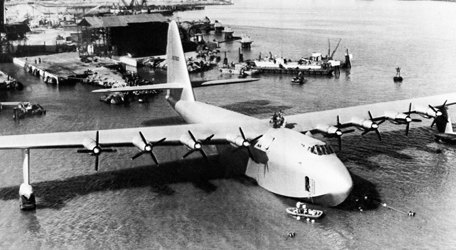 In 1942, Henry Kaiser and Howard Hughes designed an amphibious plane that is, to this day, the largest plane ever constructed. Originally named the HK-1 to reflect its creator’s namesakes, this massive plane was later dubbed the “Spruce Goose” due to its wooden construction. This flying boat was over five stories high and had a wingspan longer than a football field. Designed for transatlantic flights, the Spruce Goose only lifted off the ground once in its lifetime. On November 2, 1947 the winged giant miraculously entered the air for a flight approximately one mile in length at an attitude of 70 feet. Although brief, this jump turned skeptics into believers as the 36 passengers inside raced through the air at a speed of 135 miles per hour. 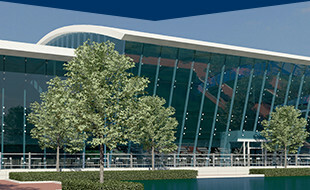 In February of 1993, the aviation icon was disassembled and transported by barge and truck to its current home: The Evergreen Aviation & Space Museum located in McMinnville, Oregon. To read more about this flying marvel click here.